ROSSBURG, Ohio (September 22, 2018) - Arctic Cat All Star Circuit of Champions presented by Mobil 1 championship contender Aaron Reutzel made his ninth All Star victory of the season look effortless on Saturday night at The Big E, charging ahead from row four to the top spot in just 12 circuits, eventually driving on to score a first-ever Eldora Speedway victory during the 37th running of the coveted 4-Crown Nationals. After starting from the outside-pole position and leading the first 11 circuits, Kokomo, Indiana’s Parker Price-Miller held on to finish second at the World’s Greatest Dirt Track, followed by Indy Race Parts teammate Gio Scelzi, Travis Philo, and Cole Duncan. In response to the tragic loss of sprint car great Greg Hodnett, the All Star 4-Crown Nationals A-main was altered from 25 laps to 27 laps. A dominating performance to say the least, Reutzel’s charge to the front started right from the drop of the green flag, advancing four positions during the first three circuits of the 27-lapper. A red flag incident on lap eight involving Carson Macedo, who was battling within the top-five at the time, gave Reutzel an opportunity to capitalize. 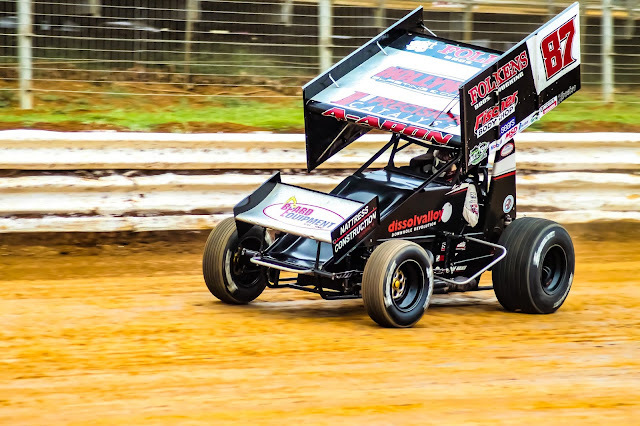 The ensuing restart resulted in Reutzel advancing two more positions, ultimately getting by Brock Zearfoss for third, then utilizing a slider in turns three and four to get by Cole Duncan to take second on lap nine. Caution flags flew again on lap 11 once again setting up a single-file restart, this time putting Reutzel right on the back bumper of race-long leader, Parker Price Miller. When green flag action returned, Reuzel made his move, actually chasing Price-Miller back to the flagstand to complete lap 11 before getting underneath the Indy Race Parts No. 71P entry at the midpoint of turns one and two on lap 12. For the second time in four laps, a big move by Reutzel equaled success, keeping Price-Miller behind him as the duo raced back to the start/finish line to complete the circuit. Despite caution flags reappearing on lap 15 creating another single-file restart, the field had nothing for Reutzel. The Clute, Texas, native drove on unchallenged, even manhandling a few spurts of lapped traffic during the final five circuits. With Eldora Speedway’s 4-Crown Nationals officially in the books, Aaron Reutzel will enter the final round of the 2018 All Star Circuit of Champions season in two weeks with a 64-point cushion in the All Star driver championship chase, also owning a 32-point lead in the owner title chase for car owner, Baughman-Reutzel Motorsports. The Arctic Cat All Star Circuit of Champions presented by Mobil 1 will conclude the 2018 season with the #GYATKExtravaganza at Kokomo Speedway in Kokomo, Ind., on Saturday, October 6.